In the midst of last month's egg recall, Food Processing's vice president of creative services got a phone call from his local Costco store alerting him to the fact that he had purchased eggs that were the subject of the recall. Isn't that amazing? Equally amazing, but in a bad way, is that the call came two weeks after he had bought the eggs. He and his family, including two young boys, had already consumed most of the eggs. No one got sick – either their eggs weren't affected or the family cooked them sufficiently to kill the salmonella. But their case is exemplary of both the power of information technology and the need to speed things up if that power is going to be put to good use. That anecdote probably comes as no surprise to government regulators. Despite all the regulations and criticality of a food recall, the Department of Health and Human Services' Office of Inspector General conducted a "traceability exercise" in early 2009. "We purchased 40 food products from different retail stores and attempted to trace them through each stage of the food supply chain back to the farm(s) or the border," according to the resulting report, "Traceability in the Food Supply Chain." New England Country Soup is a small firm "founded by three ‘foodies' frustrated with the traditional soup products on store shelves..." says the company web site. What's most interesting is the button at the bottom of the home page: Our Ingredient Tracker. "Click here to see the farm, field or ocean from which each ingredient in our great soups is sourced." For example, Yankee White Bean soup has as its first ingredient onions from Food Worker of Germany. While there are plenty of domestic ingredients, the roasted red peppers and jalapeno peppers come from Van Drunen Farms facilities in Mexico, the garlic from Van Drunen in China; the rice starch from A&B Ingredients in Leuven-Wijgmaal, Belgium; and the cumin and cayenne from India. Only five of the 40 products purchased during the study could be traced through each stage of the food supply chain back to the farm or border. HHS/OIG looked at the entire food chain, and food and beverage processors actually fared better than the other components. "Twenty-five percent (26 of 104) of the managers who responded to our questions were not aware of FDA's records requirements. Specifically, 50 percent of the managers at retail facilities were not aware of FDA's records requirements, compared to 21 percent of the managers at distributor, wholesale, and storage facilities and 13 percent of the managers at processing, packing, and manufacturing facilities." In some ways, it's odd that one of the keystone regulations for food & beverage safety is an outgrowth of the Sept. 11, 2001 terrorist attacks on the U.S. But the origins of "track and trace" do trace back to 9/11 and the subsequent Bioterrorism Act of 2002. The reassessment that followed those attacks made legislators realize that our food system was a ripe target for inflicting damage on America. Record-keeping was the obvious key. Legislators originally planned for the simple one up-one down record keeping, reasoning that if every touch point in the food system knew where its products came from and where they went to, investigators could eventually track a food product or ingredient throughout the system. Well, "eventually" eventually wasn't good enough. "We're required to respond with our information in two hours, but we can usually do it in 15 minutes," says Troy Grove, chief information officer of Berner Food & Beverage, a Dakota, Ill., maker of private label products including processed cheese, snack dips, latte and meal replacement beverages. The problem is, even if it takes his firm only 15 minutes to identify the supplier of an ingredient, what if that supplier takes the full two hours to identify where components of that ingredient came from. And that supplier takes another two hours … and so on. "And what if it's a brokered item?" adds Grove. The sum can be several hours before the source of a problem ingredient is pinpointed and, as a food processor, Grove says that's too long. Another processor asked not to be identified "because it's never popular for a businessman to ask for more government regulation. In most situations, it's best if business regulates itself. But in the case of food safety and particularly track and trace systems, maybe we need to hand that over to the government to be sure systems are interoperable and we're all on the same page." Faster and further traceability throughout the system – replacing the simple "one up/one back" philosophy with a mandate that each responsible facility that handles a food product maintain or at least have immediate access to the records of all other facilities or farms that handled that product. Interoperability of systems – standardizing or at least finding uniformity among systems so that one facility's systems and software can be read by others in the chain. 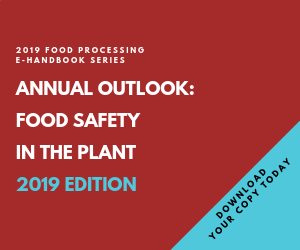 Following some of the foodborne contamination incidents that occurred last year, the FDA and Food Safety Inspection Service of USDA held meetings in December of last year and again in March of this year. Last December's meetings focused on the general need to improve traceability, and especially on the need for uniformity of systems and standardization of records. And the March meetings focused specifically on the traceability of E. coli, primarily in meat. So change is coming. But FDA officials would not say when. "FDA continues to meet with industry and solution providers to better understand industry practices and how improvements to product tracing can be made," Sherri McGarry, director of the Division of Public Health and Biostatistics at FDA's Center for Food Safety and Applied Nutrition, told us for this story. "We are closely monitoring proposed food safety legislation, which has important food tracing requirements in it. We anticipate additional pilot studies involving various industry sectors to find better ways to link the product entering a processing or distribution facility with the product leaving it, and through any other stops the product makes along the supply chain. By improving product tracing from farm to table we hope to better identify points in the supply chain where food safety might be compromised, more quickly identify the original source of contamination should it occur and ultimately build a better food safety system, which in turn improves the public health." So maybe next time the call from Costco will come before the kids have eaten the eggs.